My name is David Tovar and I am a full-time Realtor. As Realtor and Broker Associate at EXIT Castillo Realty, I place the interest and goals of the public first. I specialize in helping buyers and sellers with their real estate needs in Ventura County, California, including Oxnard, Port Hueneme, Ventura, Camarillo and Santa Paula. I work for an agency that is home to seasoned real estate leaders with a wealth of experience. We are all full time career agents. Our Broker has over 20 years of experience in the business of real estate and has been producing a weekly Spanish real estate radio program since 1993, focused on educating the community on the critical topics of real estate. Through education and professional advice we strengthen the community we serve. By focusing on these core values, our brokerage has successfully served the community for a long period of time through various real estate market cycles. Our clients can count on a strong agency to overlook their well-being. "Our experience with the Short-Sale was smooth. We live with more peace of mind thanks to David and the EXIT Castillo Realty Team. We are happy it's over." Dennise and Jose A. "Thanks to new and more aggressive marketing that David introduced we got more offers than expected. We are very happy and pleased with all his help " Irma and Francisco T.
Our Agency's ultimate commitment is helping others achieve their real estate goals: helping to sell a house quickly and for top dollar, guide thoroughly a first time homeowner, and carefully analyze real estate investment options. I truly enjoy participating in these positive transactions that help families at all levels. In addition I enjoy being part of EXIT CASTILLO REALTY which is part of the EXIT REALTY CORP. INTERNATIONAL franchise system that provides great training and supports agent and community development. I truly enjoy the family environment, creative energy, and supportive broker. In addition, I love the fact that we are part of Habitat For Humanity fundraising efforts. A portion of every transaction we close goes towards a fund that helps build homes for those in need. We go a long way to make sure our community as well as others are taken care of. I grew up in Oxnard CA and attended college in Los Angeles at the American Inter-Continental University and received a Bachelor's Degree in Business Administration. I was born in Mexico and moved to Oxnard at the age of five. I am also fluent in Spanish. I have over ten years of business experience in diverse sectors including Marketing, Retail-Management, and Supply-Chain. I leverage this experience to the benefit of my clients by providing strategic and upgraded home-marketing platforms that result in positive, efficient and profitable results. I truly enjoy my profession and the positive impact it makes on the local community. 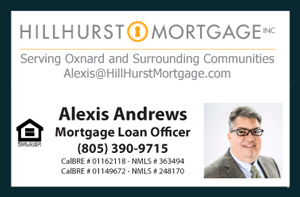 Serving the local community of Oxnard as a real estate broker is very exciting to me because I am able to participate in the well being of the local environment where I live, work, and play.